Hozier, born Andrew Hozier-Byrne, is an Irish singer-songwriter. His debut album "Hozier" was released in Ireland in October 2014. With his charity single "Cherry Wine" in 2016, Hozier wanted to draw attention to domestic violence worldwide. Hozier's new tour was announced shortly before the release of his new album "Wasteland, Baby! on the first of March. The tour announcement comes just ahead of the release of Hozier's new album »Wasteland, Baby!«, due for release on 1st March via Island Records. Born Andrew Hozier-Byrne, Hozier is an award-winning musician, singer and songwriter from Ireland. His number one, debut studio album »Hozier« was released in October 2014 and includes the multi-Platinum, Grammy-nominated anthem »Take Me To Church«, which later won »Best Song« for Hozier at the 2015 Ivor Novello Awards. The record also featured the optimistic, up-tempo »Someone New«, the soulful »Work Song«, and early stand out »From Eden«. In 2016, Hozier released the album's closing track »Cherry Wine« as a charity single to create awareness of the domestic abuse problems worldwide, with proceeds benefiting a series of international domestic abuse charities. The official video features 3-time Oscar-nominated actress Saoirse Ronan. Hozier followed up the success of his debut LP with the track »Better Love«, taken from the soundtrack of the Warner Bros' adventure film »The Legend Of Tarzan«. His »Nina Cried Power« EP is out now, and more music is set to follow in due course from Hozier. The Wiener Konzerthaus ( Vienna Concert House or Hall) is one of the largest and most artistically progressive institutions in international musical life. During the course of a season, which extends from September to June, some 750 wide-ranging events take place and more than 600,000 visitors can listen to around 2,500 different compositions. 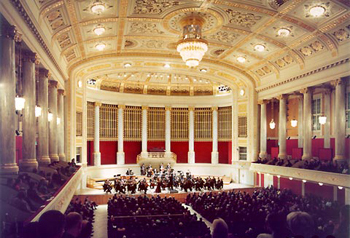 With this comprehensive and varied selection, the Wiener Konzerthaus – together with the Vienna State Opera House and the Musikverein – is central to Vienna’s reputation as one of the world’s leading music capitals. From its earliest days, the Wiener Konzerthaus has held the highest cultural aims and artistic mission: «To act as a venue for the cultivation of fine music, as a meeting point for artistic endeavour, as a home for music and a cultural centre for Vienna». It was in this spirit that the Konzerthaus was inaugurated on 19 October 1913 with a festive concert attended by Emperor Francis Joseph I. To mark the occasion, Richard Strauss wrote the «Festliches Präludium op. 61», which was followed by Beethoven’s Ninth Symphony. This programme combination, comprising a contemporary work and a masterpiece from the past, served as a model for the Wiener Konzerthaus’s future direction: today, too, an awareness of tradition and the joys of innovation form the main pillars of the Konzerthaus’s artistic identity. Short walk from the U4 Stadtpark Station: 10 min walk from the U4/U1 Karlsplatz Station, or take the 4A bus. From the tram and bus stops at Schwarzenbergplatz, accessed by D, 2 & 71 trams and 3A & 4A buses. The 4a bus stop is at Hotel Am Konzerthaus. The nearest taxi stands are at the Hotel Intercontinental in the Johannesgasse and at Hotel Am Konzerthaus on the Heumarkt. In the heart of the building (which consists of more than 600 rooms) lies the Konzerthaus’s flagship, the Grosser Saal (Great Hall). Designed with a sense of space and classical balance, its stage has provided the setting for many memorable concerts over the years. In this room, artists, audiences and atmosphere blend into a harmonious triad. Home to world-famous orchestras, virtuoso soloists, renowned conductors and legendary jazz musicians, the Great Hall can accommodate an audience of 1,800 and offers the perfect venue for a wide variety of musical activity. The Great Hall has emerged from the major renovation with renewed splendour and, despite improvements in technical installation and audience comfort has continued to conserve its original elegance. 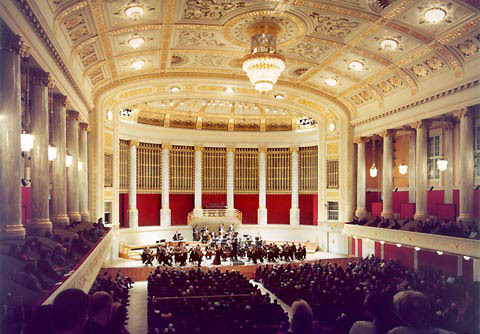 Its unique atmosphere ideally lends itself to the broad range of artistic activities offered by the Vienna Konzerthaus. Open and relaxing, welcoming and intimate, with its incomparable appeal, the Mozart Hall constitutes a jewel of international musical life. The perfect setting for all types of chamber music, from lute and Lieder recitals to string quartets and chamber orchestras, it can accommodate an audience of around 700 – an ideal size in which to experience the intimacy of chamber music and recital performances. 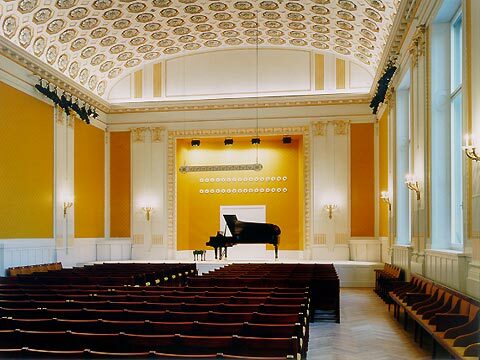 The Mozart Hall enjoys world-wide acclaim on account of its unique acoustics. This distinction makes it a top favourite with leading ensembles and soloists – as well as a popular venue for recordings. This was taken into account during the major renovation of the building: as with all other rooms in the Konzerthaus, the Mozart Hall is directly linked to a recording studio and a technical control room. With its festive character, the Schubert-Saal presents the perfect model of a music salon, the restored use of the windows follwing the renovation having returned the room to its elegant, airy appearance. 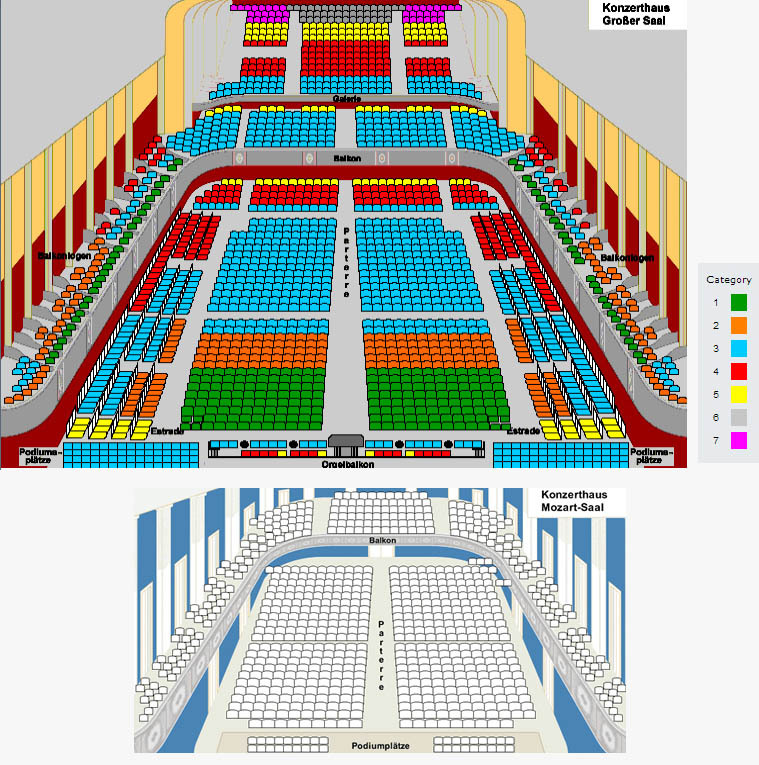 Equipped with around 320 seats, it lends itself to a wide range of chamber-music concerts, as well as to receptions, dinners and lectures. It is home to the popular lunchtime concert series, as well as to events which enable promising young musicians to experience a professional concert stage. 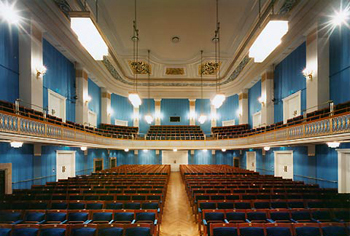 Many a musical career has been launched in the Schubert Hall of the Vienna Konzerthaus.